My brain may be painfully high on varnish fumes, but I'm pretty sure this is the most horribly freezer burned ice cream I have ever tried, and that's a shame because I'm pretty sure this is a top notch flavor. There are these delicate flakes of chocolate through the ice cream which makes it one of the coolest looking ice creams I've seen in awhile. Let start at the beginning. They are redoing the flooring in our new office space and the A/C sucked up all the fumes and dumped them into our part of the building. I decided to take a long lunch to clear my head. Oh my way back I ran into Walgreen's, rather than going for a tasty strawberry coolatta (small's are only a $1.99 now, woohoo!). 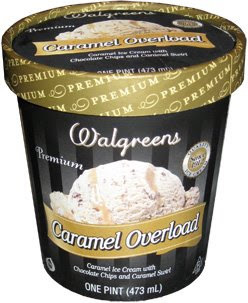 Anyway, I checked out the flavors and picked out the interesting Caramel Overload for $2.29. It's billed as a caramel ice cream with chocolate chips and a caramel swirl, but like I said, calling them chips would be wrong. Tasty looking flakes would be better. I got back to work (which now stinks of a second coat of varnish) and opened up the container. It wasn't full, in fact, it looked like it had shrunk. No matter, I'm starved. I dug in and found the ice cream to be very gritty. It's not that it tasted awful, and for a second I even debated if it was on purpose, but then i realized all the ice crystals buried deep in the ice cream (instead of on the outside). The flavors combine for a pleasant and mild flavor, but maybe the freezer burn has affected the taste. Is the swirl always this pleasant, or has the flavor been diluted by ice crystals? Such a waste of a potentially perfect pint. I really like how the chocolate flakes add flavor (and good looks) without adding crunch. I'm going to have to rescoop a fresh container of this stuff because I think it could be really good ...and preferably do it in the fresh air. Update: I decided to ditch the ice cream before I was tempted to try and finish it. I did notice something as it melted though. Instead of chips, or even flakes, let's go with chocolate shavings. Not the thin curly type, but thick rough looking shavings. I've read your comment several times trying to craft an appropriate response, I'm not sure I have it, but here goes. freezer burn may not be the best term, but I think most readers get the idea that it was some kind of freezer related problem that messed with this ice cream. The freezer might be bad, but it came from a Walgreens that was built within the last year, so the freezer should still be in tip top shape. I just had the same experience with a pint of the cake batter lavor. It looked like it had shrunk and it was just very ice like consistancy wise.